I can’t put this down and I can’t stop telling my friends that they have to read it ! When I told them about it they ask with some trepidation “am I a difficult woman“ I responded that “yes one wants to be“. I keep looking up at the top of my chapter to see how many I have yet to go, only 29, I wish this could continue forever I spend choice parts of the day reading these essays and being inspired and reminded of why I have fought such similar battles and proudly think what would my essay look like. 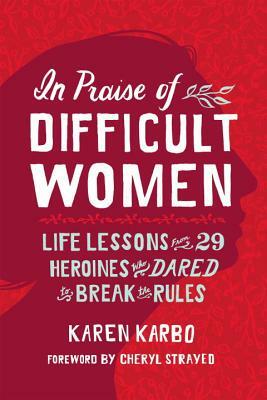 Karen amazingly incorporates wonderful observations of the universal battles that strong women have to fight with the historic accomplishments over the past century and weaves them into lovely summaries of the lives of amazing women. I’m so happy to have discovered this author and can’t wait to read everything else she has written ! Having spent decades as the only female physician among so many men, I love how you bring clarity and acknowledgment to the hurdles that are important for women to jump over to maintain themselves and allow their exquisitely valuable contribution to the landscape is success! I’m over the moon to read your post, Mary. I bet that as a female physician you’ve become pretty adept at being “difficult.” Thanks for the love!